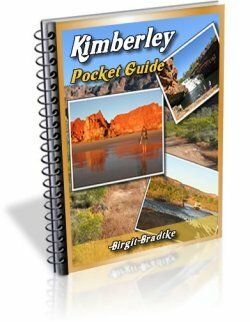 Brigit your Kimberley Pocket Guide is a must for anyone planning a trip in this wonderful region. It contains so much common sense and helpful information. 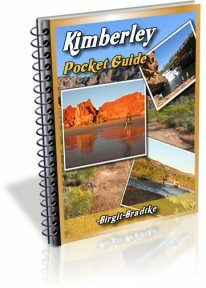 To also help plan our trip I also found a small guide called the Gibb River & Kalumburu Roads 2009 Traveller's Guide to be of invaluable assistance. The distance table and the very brief snippets of information was just a brilliant addition to your guide and so helpful. A call to the Derby Visitor Centre, a fee of $5 for the booklet, and postage is a very worth while investment to aid the planning of any trip. 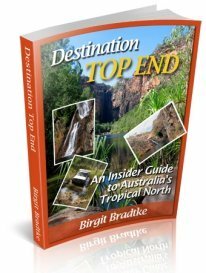 Studying your guide and reading traveller's feed back we decided to travel from Broome along the Gibb River Road at the end of May, as we wanted to see the region in its fullest glory. And we did. We were treated to nature's best with lush greenery everywhere, with the rivers and creeks still in flow, and some amazing and beautiful lagoons and waterfalls. 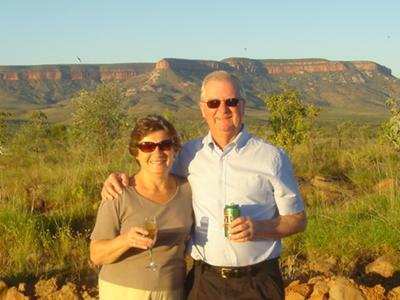 My wife and I are "seniors" in our mid 60's but we had no qualms at all after reading your guide about making this trip on the Gibb River Road, which has been an ambition our ours for many years. And yes we finally did it - and more. We added the Katherine Gorge and Kakadu to our trip before returning to Broome for a well deserved week on the beach before flying back to London. We had decided - as we had a month for this trip - to give ourselves time and really enjoy the Gibb River Road experience and we allowed ourselves 10 days for the trip from Broome to Kununurra. We therefore planned our trip in 4 stages, with 3 nights at Mount Hart, 3 nights at Mount Elizabeth Station and 3 nights at Home Valley Station. This gave us time to explore and see the real out of the way gems in each of these locations. And it was worth it. We set off from Broome on May 27th and for the final hour on the Gibb before the Mount Hart turnoff, and also running into Mount Hart the heavens opened. It was quite an experience, but taking it steady we made it thru without any problem. The next day it dried up, but that rain and the unseasonal downpours the previous week gave the entire region a very special fresh feel. We were so lucky to have been there at this time. We were privileged to have had the time to devote to this fabulous trip, but we met so many lovely people who were on a mission to complete the Gibb River Road drive within a very limited time schedule, and unfortunately with little or no time at all to really explore. We found that the majority of people were dropping into the places where we stayed just for one night, with perhaps only time for a very brief morning trip in the local area, before heading off again. There are many local spots within the area of each of the places where we stayed, which are truly beautiful, unspoilt, and so far off the main track that they are seldom visited. No hoards of people and tour guides babbling away in Italian, French etc... We had the opportunity to visit a number of spots which were so beautiful and peaceful that words cannot describe or photos do justice to these very special experiences. I am sure that this is the case where ever you stay along the Gibb River Road, but you need time. It was a truly wonderful experience and we consider ourselves so fortunate to have been able to make this trip. May I pass on a couple of tips to those contemplating seeing and experiencing the Gibb River Road. Firstly book as early as possible, as you may find the specific dates you require at your preferred locations are not available owing to tour bookings or functions. I booked our accommodation back in early November 2009 (for end May/early June 2010), but even then the Homestead accommodation at Home Valley Station was totally booked out for one complete weekend (for a wedding), and as a consequence we had to make some adjustments to our original idea for the schedule. This did not create any issues for us, but with limited accommodation options along the Gibb River Road, it could be bit of a lottery if you do not book your preferred accommodation to suit your schedule and time frame well in advance. My second point relates to 4x4 rentals. It goes without saying that it essential before making any trip which requires renting a vehicle to make a cost comparison study. This is especially so in Australia where exceptional high insurance excesses are common place, and also as I found from some of the quotations I obtained for a 4x4 for this trip, totally unreasonable and unrealistic daily mileage allowances. The monetary insurance excesses quoted by some rental companies for 4x4s for the Gibb River Road were beyond belief. In some cases even with the quoted very high additional daily insurance premiums, some of the excesses you would have to set out with would not give you too much comfort. Obtaining a very reasonable package with a good basic rental cost for a quality 4x4, with unlimited mileage and a low insurance excess with a reasonable daily premium is possible, but it takes quite some digging. I am certainly not against comparison web sites, but I found in some cases that some good potential runners and riders in the 4x4 rental stakes were not included. The 4x4 rental is a major cost item especially for this trip, and taking a little time looking at the detail below the "headline" numbers can save money and if you wish reduce your excess exposure at a reasonable cost. Yes - we would do it again! Thanks for writing Gill and Ray! Great photo :-). and a great attitude. Taking enough time really is so important. Thanks also for your email. I had meant to write back to ask if I'm allowed to share your experiences with my other readers as well. Just never got around to it! PS. : Thank you very much for the kind words. I am surprised to hear that you find the little pocket guide so useful. 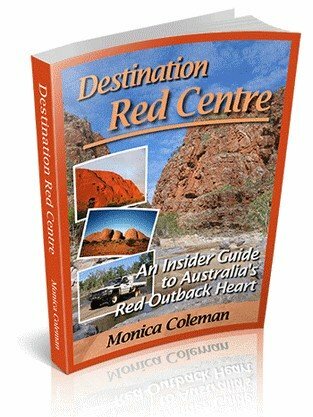 After all it was written only as an introduction for people who know absolutely nothing about the Kimberley and are in the very early planning stages, and not as a real guide book.